What’s the secret to happy, healthy families? 5 simple, healthy vegetarian meal plans each week. A complete weekly shopping list to keep you within budget and get you in and out of the grocery store, fast. 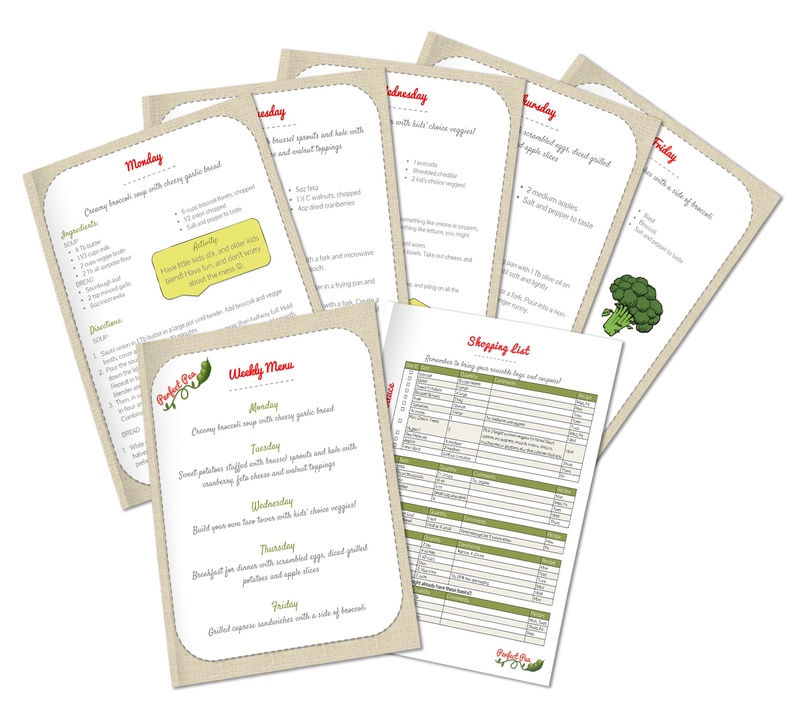 Printable menus to display each week that your whole family will love. PLUS! Activities with each meal to involve the kids and make dinnertime more fun. Yes! Sign me up for Perfect Pea! You’re committed to your happiness and health AND want to save some money along the way! Subscribe to our annual program for only $72 per year (less than $1.40 per week). That’s 12 full months of Perfect Pea healthy vegetarian meal plans sent straight to your inbox every week. That means stress-free dinnertime, a happy family with full bellies, lots of fun activities and conversation topics, and peace of mind for YOU. And you’ll save your membership fee and then some with your pre-planned grocery lists and carefully crafted meal plans. But as you know, when it comes to your family, health and happiness are priceless. For just $7 per month, you can bring happiness and health back to dinnertime. And not just for you, for your entire family. Isn’t it time you decide that your time is worth more than planning meals and grocery lists each week? Simply by taking control of dinner time and letting Perfect Pea help, you’re taking the first step toward health, happiness, and more fun for your family. Yep, it’s official. You’re one smart cookie.